Each pack consists of a reusable ergonomic handle for solid grip and two replaceable bristle heads. Luckily both you can get a new toothbrush end which last for another 2–3 months of proper cleaning. Our bristle profile is based on the latest medical research and provides you with an optimal cleaning performance. Here we could add a bunch of marketing bla. But why? It really cleans your teeth well. The slightly angled and medium sized brush head ensures an optimal navigation in the mouth. The bristles’ bi-level cut (medium stiffness) let’s you reach every last corner of your teeth. The rounded tips guarantee the right polishment, yet are gentle to your gums. 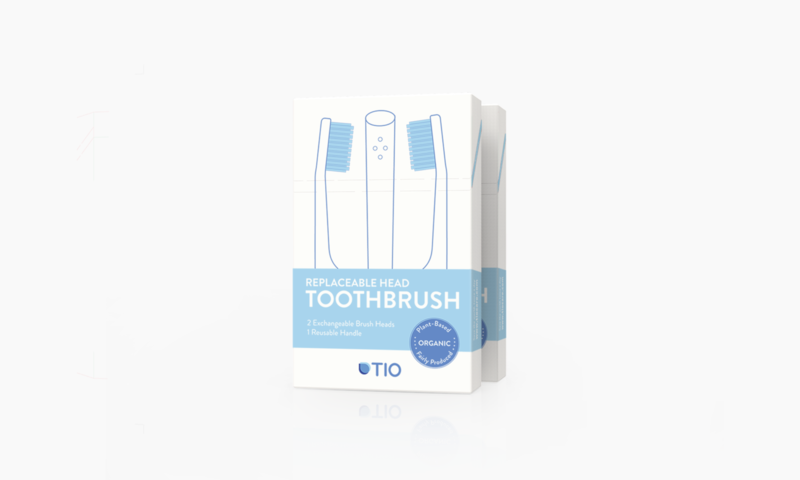 Our innovative, exchangeable brush head mechanism avoids 70% of plastic waste during each usage period. It makes the environment smile while you get a truly hygienic fresh start as the full top is replaced. All parts are made of fast growing plants, whose photosynthesis removes CO2 from the atmosphere while releasing pure oxygen. Furthermore, the radical reduction of fossil based raw oil and additives like BPA ensures that all materials go well with your health.